Fitbit gained popularity for its fitness tracking bands and has been competing with other companies like Jawbone to gain supremacy in the fitness tracking market. The company today unveiled its trio of new wearable devices aimed at the fitness centric crowd. The Fitbit Charge is essentially a redo of last year’s Fitbit Force which was recalled sometime earlier this year due to users reporting skin irritation. The wearable has a tiny OLED screen that it uses to display steps, distance traveled, calories burnt along with incoming calls notifications. The main highlight though is the week long battery life. Priced at $129, is available for purchase starting today and comes in a number of different colours. Take the Charge and slap a heart rate monitor on it and you have the Fitbit Charge HR. Fitbit uses their own LED technology to measure your heart rate from your wrist and is supposed to be used mid workout, ie you don’t have to be standing still to use it. 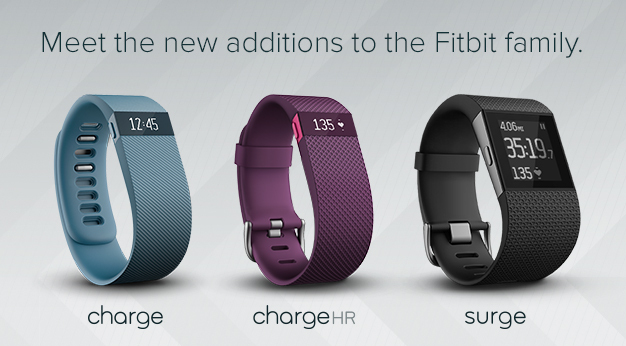 The Charge HR comes in at $149 and will reportedly last 5 days on a single charge. The Surge is the most distinguished of the new lot of wearables, not only because of its full size black and white touch screen display, but also because of its 7 day battery life. The Surge has built in GPS, an HR monitor, 3 axis accelerometer and even more! With the touchscreen, you have access to SMS notifications, music player controls and even some customizable watch faces. The Surge will be available for purchase in early 2015 for $249. Question is, will people be willing to drop $249 for something centered around physical activity only?